The following description and facts are taken mostly from the excellent book by Johnson and Wheatly on the History of Pawtucket, Rhode Island. Bucklin’s Brook was a stream that came out of a cedar swamp around the foot of John Street and flowed south through the freight yards, through Oak Grove Cemetery curved by what is McCoy Stadium and headed toward Prospect Street and Maryland Avenue proceeding until it emptied into the Pawtucket River near Beverage Hill Avenue. It all now flows underground. It formed much of the east boundary of the Bucklin land holdings. See the map on the left, courtesy of Spaulding House Research Library. (Click to enlarge.) The 1691 roads to Attleborough, Taunton, and Rehoboth are in 1999: Cottage Street, Central Avenue and North and South Bend streets to Columbus Avenue. The northern boundary of the Bucklin land of 1691 is what in 1999 is approximately East Street near the South Attleboro line. The dividing line between Joseph Bucklin’s northern land and the heirs Benjamin is approximately 1999’s Sanford Street, and the line between the heirs of Benjamin and Joseph Sr.’s southern third is approximately a little north of Johnson Street of Pawtucket. William Bucklin had his house at what would be today the east side of South Bend Street opposite the end of Johnson Street; land now occupied by the Agnes Little School. In 1659, William’s son Joseph announced his plans to marry Deborah Allen. With this, William deeded the northern third of his 600 acres to Joseph with the promise to build Joseph a house within one year. The house was built at approximately what in 1999 is the location of Royal Square at the intersection of Central Avenue, Cottage Street and Sabin Street of Pawtucket, Rhode Island. 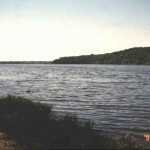 In 1664, William deeded the central third of his 600 acres to his other son, Benjamin. Benjamin’s heirs (see below) built their house at what in 1999 is known as the corner of Walcott Street and the junction of North and South Bend streets. After the granting of the two thirds of his land to his son’s, Willliam’s will provided that upon his and his wife’s death, William’s own southern third was to be equally divided between the two sons. However, Benjamin was killed in the Indian war called King Philip’s War in 1676 in an action known as Nine Men’s Misery. He was not yet 36 years old. He left a wife, Rachel (Wheatly) Bucklin and six children as his heirs. William Bucklin died in 1683 and his wife in 1687. William’s third of his 600 acres was transferred totally to Joseph. 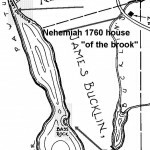 Therefore, at the death of William, both the northern third and southern third of William’s 600 acres belonged to Joseph and the middle third belonged to the heirs of Barak Bucklin. (See map above.). 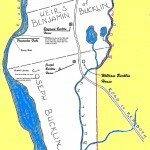 Joseph Bucklin Sr., like his father before him, gave shares of his homestead land, while he still lived, to each of his four surviving sons: Joseph Jr., Barak, James, and Isaac. 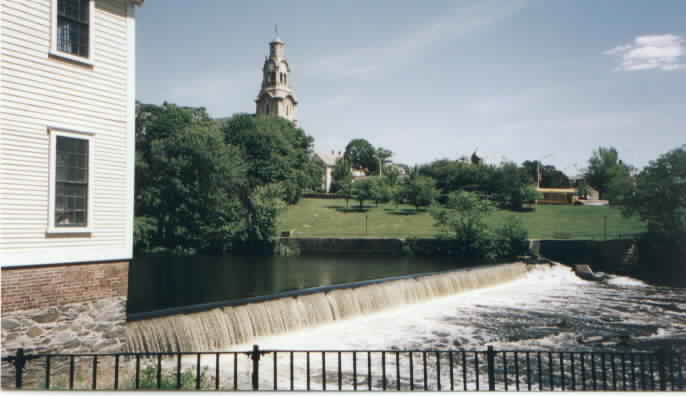 A 1999 view looking across the Pawtucket River, RI from the area of the historic Slater Mill, the point of the start of the Industrial Revolution in America, to the present Congregational Church and what was Bucklin land in the 1600’s. 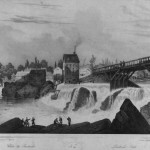 This is a truly remarkable antique 1815 French lithograph (labeled “Pawtucket Bridge” and “Pawtucket Falls”) of the view from the original Bucklin lands looking across the river toward the Slater mills. (Click to enlarge to view the remarkable detail.) The men fishing on the rocks in the foreground are standing on the ‘fishing rocks” of the Bucklins. 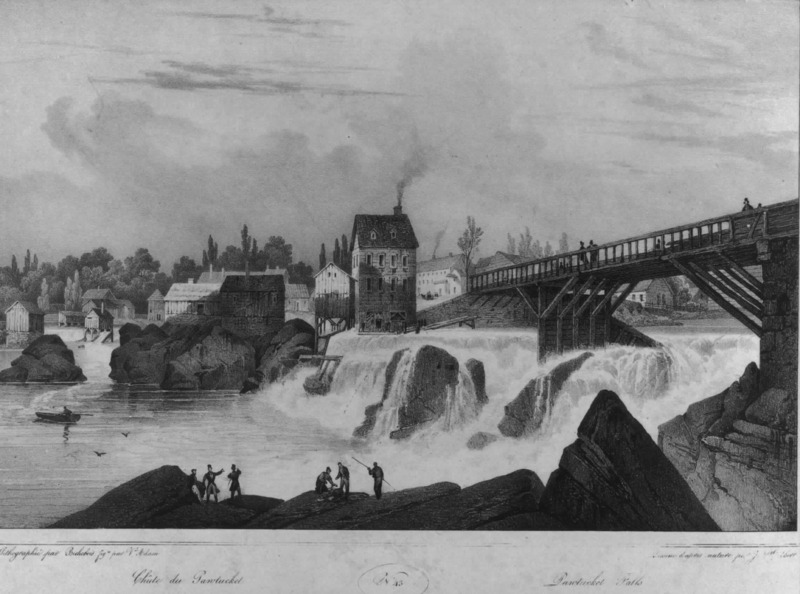 The Grist Mill of James Bucklin would have been to the right, out of the lithograph area. Isn’t it fun to imagine that the artist may have had actual Bucklins in the drawing he made? Credit for obtaining for us a copy of this lithograph , as well as the drawing on the right below, goes to Spaulding House Research Library. The falls has a drop of 25 feet, although naturally there was a substantial downwards slope in the river immediately above the falls. 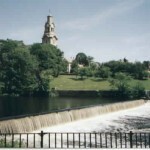 In 1718 a dam of grave and stone was build at the natural falls to better harness the waterpower for the use of mills at the site. The natural drop above the falls and how it was harnessed can be seen in the first photo above on this page. 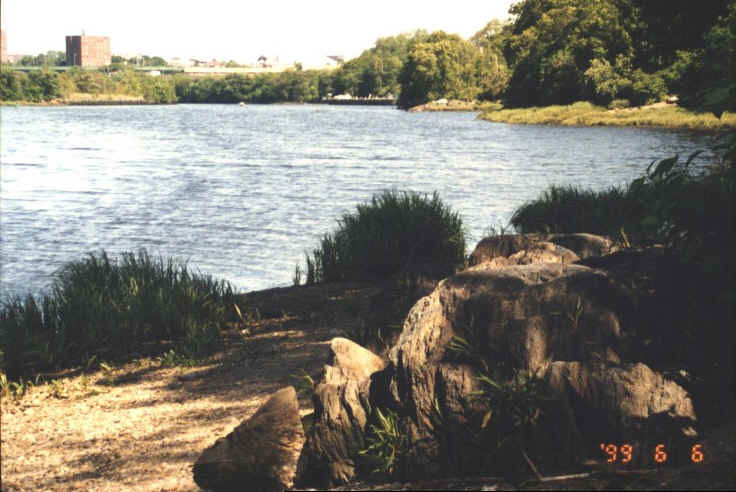 A 1999 view of the bridge and falls area. 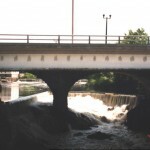 The bridge is the present Main Street Bridge. The grist mill of the early Bucklins stood out of the area of the photo, but on the right side of the river bank. The Bucklin fishing rocks were in this area, but now covered over by bridge materials and the places where mill factories later stood. 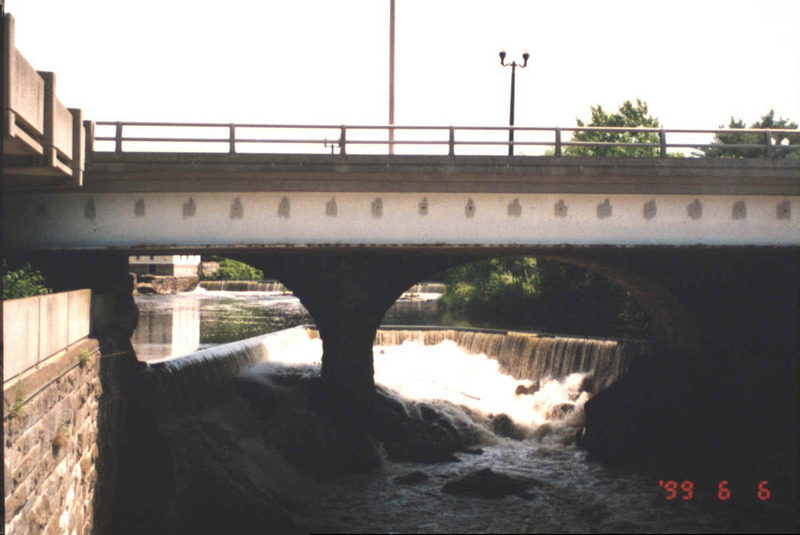 To see where the 1747 grist mill of James Bucklin stood in relation to the bridge of that day go to our page on the Grist Mill. 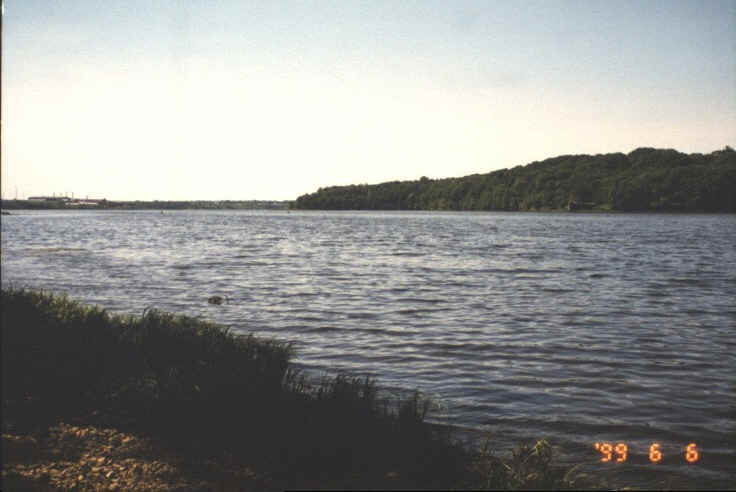 The right (East Bank) , as far as you can see in this photo, was William Bucklin’s land. The photo on the right is a cropped area of the photo on the left. The place to which the red drawn arrow points, at the top of the cropped area of the picture, you will see a long horizontal line which today is a concrete municipal landing. 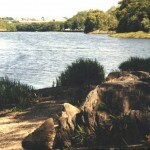 In Colonial times it was known as Bucklin’s Landing, a good place to land a boat from the tidal river instead of continuing northward against the flowing Pawtucket River with its high banks.. This picture which looks South from Bass Rock and shows the nature of the tidal river and why early ships used Providence as a harbor (and one of the several reasons why William Bucklin’s 600 acres were a prime piece of property).